Introducing DURAGADGET’s brand new, premium quality table-top tripod for your camera. Easily converting into a monopod with its removable telescopic tube, this tripod offers functionality and versatility and is designed to be compact, lightweight and ultra-portable. The multi-purpose and fully removable telescopic tube offers multi-angle viewing by either adding height to the table-top tripod or functioning as a handy monopod. The tripod features flexible legs, for adjusting the height further to ensure you capture that perfect viewing angle. Quality isn’t compromised in favour of versatility though, and this strong and sustainable tripod features a rubber coated telescopic tube for aiding grip and promoting stability. 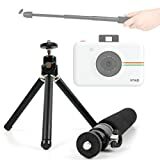 The rotating ball-tilt head adds to the functionality of the tripod and its lightweight design makes this piece of kit the perfect travel accessory. N.B. Please note that purchase of this item is for 1x Travel Tripod & Monopod only and does not include any device that may have been included in corresponding images.